In Life is for Living, Not for Waiting Around, Anita Yoder tells and shows singles in particular, and the rest of us, exactly that. Anita is a creative researcher and word-crafter who lives what she writes and writes what she lives. Two little wrinkles here: her book is out of print at the moment and Anita lives in Ireland. Try these U.S. sources to get the copies that are still available: SMBI1@juno.com, martins@emypeople.net, and Green Pastures Press at (717) 436-9115. Check out Anita's blog here. You'll get a good taste of her writing. She says, "People can watch my blog for when it will announce when/where the books will be available again, which will hopefully be no later than February." I read Romaine Stauffer's Circle of Love many years ago, and then one fine day she and her family came to Ontario to visit her brother Merle, and I met her in the hallway of the NYP guesthouse, and she was obviously exhausted from traveling, but I still greeted her with a gushing oh-my-goodness-I-can't-believe-it's-really-Romaine-the-Writer AND a rundown of my own writing dreams. To her eternal credit she does not remember this. Later we met again in a writing workshop in Virginia and had fun getting to know each other--no gushing this time. Romaine has written a number of books but her latest are the self-published Annie's Day of Light and A Home for Sarah. You can order autographed copies at staufferhof@comcast.net. I shed my own tears reading Tears of the Rain because so many things reminded me of our months in Kenya. I met Gertrude Slabach in 1998 when her sister Ida Marie arranged for us to meet and we had supper at the Slabachs in their wonderful old house in Virginia. Gert, like me, has six children and writes a family-life column for a local newspaper. She won an Amy Award one year for her story of her mother-in-law's homegoing. The expanded version of this story is her book, Aren't We Having Fun Dying?! "There's another book that I helped write and edit, but it's not for public sale at this point [Family Jaunt of Memories]. My family (12 living children of my father & memories of 4 deceased siblings) put our memories into a book with lots of photos and glossary, etc. If anyone is interested in self-publishing a family book, I'd be happy to give (free) advice and share our experiences with Lulu." I met the friendly and energetic Catherine Yoder from Indiana a couple of years ago when she stopped in at a book signing of mine in Goshen and gave me a copy of her book about her family's heartbreaking history. She says, "My book, Hold Them Near, is still available. It tells the story of my grandparents and how their faith was tested by the death of eight babies. The price is $6.95 + $2.00 shipping. People can contact me at bookworm@bnin.net or write Catherine Yoder 18646 C.R. 46 New Paris, IN 46553. (F.Y.I. Just in the last several years, researchers have identified the gene responsible for the heart defect, so our family has more information for the future.)" Donna Kauffman and I have a long history going back to our early days in Canada with Northern Youth Programs. We have very different writing and speaking styles* but when we get together our husbands just sort of sigh and smile because we talk publishing, writing, ministry and such with great intensity for as much time as we have. *Not sure how to describe our differences except she's a lot deeper and more poetic. Help me out here, Emily, you just heard Donna speak. Donna has written at least six books, collections of meditations and stories, and I won't list them all here but will direct you to her website where you'll find a book that fits whatever stage of life you're in. Dorcas Sharp Hoover's House Calls and Hitching Posts is listed on Amazon under pretty much the same categories as my books and most of the time it outranks mine by a long way. It's a fascinating book and Dorcas deserves its success. Besides our first names, we also share these facts: six children apiece and published by Good Books. The one and only time we met, her husband shook Paul's hand and said, "I'm known as 'Dorcas's husband.'" And Paul said, "So am I." I thought that was sweet. Dorcas has also written some books that are available through Christian Light Publications. Sharon Schnupp Kuepfer and I go back to our Canada days as well, and now her daughter Kayla is Emily's lifesaver at SMBI. Sharon is an amazingly disciplined and efficient person/mom/writer. Her books are available on her website. The first one inspired me to homeschool Emily in the seventh grade when she was having a lot of health issues. I haven't read Vera's Journey by Judy Yoder but I'm sure it's fascinating. I first got wind of it when a daughter of Vera's visited in Oregon and told me her mother's story, especially how she lost all of her hearing in one weekend when she was 38 years old. She went on to successfully raise her large family and was capable and independent well into old age. The book was recently released by Vision Publishers. I don't have the author's contact information but if you do, leave a comment. I guess I've met Judy Yoder too, briefly, at this amazing, gigantic book sale that my sister took me to in a big pole barn in the countryside near Dayton, Virginia. You can also leave a comment to add more information, suggest authors I've missed, review any of these books, etc. "I believe in the power of story–am overwhelmed with it really, because all my life I will be plumbing its depths–remember how other storytellers have influenced me, and tremble to think I can tell stories that influence others." On Tuesday I posted that you can send me recommendations for people that I could give one of my books to. A few suggestions came in and Paul said, "So how are you going to decide which ones qualify?" I said, "Do you really think there's any chance I can turn any of these down?" because at least one of them had me in tears and the others were close. Those books are all on their way and I still have some designated for giving, so feel free to send more suggestions. Also, after I posted about Mennonite women authors, I got some interesting feedback on some that I hadn't mentioned. So I'd like to do another post on the subject soon. Feel free to send suggestions. Criteria: woman, conservative Mennonite, author of a book that can be ordered for Christmas. Me: Take this hamper upstairs and get the empty hangers in your and Ben's closets. Steven: Hmmm, perfect timing to wear this shirt. The last time I traveled I was stuck in Minneapolis overnight, and I got to know a few of my fellow travelers in that odd way that friendships spring up instantly in such situations, like desert flowers after a rain. Two such women I'll call Frances and Lynn. Both were from the Colorado Springs area, and they had known each other years ago and met by chance on this multi-delayed flight. In fact, Frances's husband was a dentist, and Lynn had been his hygienist for 13 years. They were fascinated by my Mennonite life and six children. The conversation turned to grandchildren, so naturally I listened and didn't talk. And gifts for grandchildren. "WHAT do you get for the grandchildren?" one asked. "They already have everything." The other shook her head in agreement and shared disbelief. "Everything those children could want or even think of wanting, they already have." "I finally started just sending a birthday card and a tiny little gift, like a pack of gum, and then I put money in a college fund for them," said Frances. Lynn told of a recent Christmas with her sister's family. The sister had, in a desperate attempt to finally get something the 8-year-old granddaughter would love and appreciate, bought a large elaborate dollhouse with hand-carved furniture that was the beginning and end of dollhouses. "It must have cost hundreds!" exclaimed Frances. Lynn shook her head. "No. Thousands." She went on, "And the granddaughter came downstairs, opened her gifts, looked at the dollhouse, thanked her grandma, and didn't pay any more attention to that dollhouse the rest of the day." Frances and I were looking at her slack-jawed. Lynn looked at me. "I'll bet your children wouldn't have reacted like that." I assured her that was true. In fact, I can just see the raptures Amy and Emily would have been in at that age if someone would have given them such an incredible gift--the round shining eyes, the reverent stroking of the wood, the careful inspection, the exclamations, the delight, the gratitude. So I felt like I had maybe done something right as a mom and there has been redemption for our poor days and constant frugality. However. It wasn't too long until I realized there's another side to this, and that is that God has given me dollhouses, as it were, of the most astonishing beauty and detail and expense, and I have so often either ignored them or glanced at them briefly, muttered my thanks, and not looked at them the rest of the day. For instance: water. To think I can go to at least six places in my house and turn a knob and out comes clean, pure water that I can wash my hands in, fill a kettle with, or drink without the slightest filtering or fear. And there's more there than I will ever use. And it's free. And if I turn this other knob, the water comes out hot! Imagine explaining that to a woman in Darfur. And telling her that most of the time I take this completely for granted. Wow. Not to guilt myself, just to remind myself today to think of all these gifts and to be awed and grateful again. Happy birthday to my dad, who is 93 today!! May we all be raising rabbits and cutting wood at his age. And hugs to those who are missing loved ones today. I'm remembering Lenny my beloved nephew, Neil (who was born while the rest of us were at my first Thanksgiving dinner with the Smuckers, in Orval and Lena's house, and his grandma was all fluttery and his grandpa was way too calm, and cousin Brian thought there should be an apostrophe after Neil's middle name, Darin, to show his future personality I think), Marilyn (my friend and also SIL Laura's mom, who passed away I think the night after Thanksgiving 25 years ago. She was a sweet and amazing woman.) and there are lots more. Special thanks to you Shoe readers who take the time to read what I write. That is an astonishing gift to me, and I appreciate it deeply. "I all of the sudden realized how hilarious it is that everyone eats turkey on thanksgiving. It's like a bizarre attempt to set a world record for "most people eating turkey at once." The number of conservative Mennonite women authors is increasing, which makes me very happy. I'm going to tell you about a few of them and suggest you buy their books for Christmas presents. I will be blunt: these authors will do much better financially if you buy directly from them rather than from Amazon or bookstores. Nothing against either of those, just against pitiful royalties. Plus you get autographed copies from the author. First we have Ruth Kuepfer, whom we met in Kenya, where she lived for a number of years. She wrote Deliverance for Duncan, the story of a street boy in Kisumu. Ruth weaves detailed context and culture into her story and if you want a vivid picture of Kenyan daily life or just a good story, get this book. You can email Ruth for purchasing information at chai.with.ru@gmail.com. Here's her xanga. Next up is Michelle Beachy who just wrote two children's books, hardcover, full of amazing photos--We Build a House and My Brother's Keeper. You can contact her at smilesbymiles@gmail.com. Michelle also wrote a post on her xanga today that made me laugh out loud and then it made me get teary because I don't deserve such strokes, no I do not, but we don't deserve grace either but when it shows up it is exactly what we need, and this was a touch of grace. Here's her xanga. My friend and encourager Mary Hake has written hundreds of news articles, stories, devotionals, and such. You can find her contributions in these collections. I especially enjoyed Life Savors. She also wrote a Creation curriculum that looks like fun. I need to add that Emily was recently nominated for a CYBIL award, one of 52 in the Nonfiction Middle Grades/Young Adult category. We'll find out after Jan. 1 if she made the short list, and on Feb. 14 if she won. Last of all we have my three books, Ordinary Days, Upstairs the Peasants are Revolting, and Downstairs the Queen is Knitting. $10 each plus $2 postage. Christmas special: $25 plus postage for a set of the three titles. Again, dorcassmucker@gmail.com. One more thing: I like to give away a few of my books now and then. If you know of someone who "needs" one of my books for Christmas, send me an email or Facebook message and nominate them. Include their name, mailing address, and why they should get one. Of course you won't nominate yourself; we already know that. I'll pick the ones I think are most deserving and mail them a book. Special consideration to young harassed moms, financial hardships, and folks with a double measure of heartache. "I should write stories and sell them. It would be an easy way to make money." This afternoon Amy was upstairs watching The Hiding Place. I brought her some mint tea, since she's still sick, and stayed to watch for a few minutes, but then I had to leave because I couldn't stand it. I cannot imagine doing what the ten Booms did. Working with the Dutch Underground, taking in Jews, living with raw fear and extreme risk every minute of every day. Today they are honored in many ways. Israel named Corrie "Righteous among the nations," the Queen of the Netherlands knighted her, and there's a museum in the family's honor. What fascinates me is that if it hadn't been for the Holocaust, probably no one outside their community would ever have heard of them. They were quite ordinary: an old Dutch watchmaker and his two spinster daughters. True, they were well-known locally through their business and also in charity work with the handicapped, children, and the elderly, but nothing that would have warranted their own Wikipedia page. So, how they lived when life was ordinary prepared them for when life was hideously extraordinary. I don't think I need to say there's a lesson there for us. We are still battling sickness on all fronts but I am trying to tell myself my life is exciting anyhow. And I have to say it has its moments. . .
Last night around 11pm my cell phone beeped its text-message beep. I was already in bed and almost asleep but of course my eyes flew wide open as I imagined, in a split second, that Emily had taken a turn for pneumonia and Matt was in a bad accident and well, you know how we moms are. It was a message from Matt: "Is it true that turkeys can drown if they look up while its raining?" I looked it up on Snopes.com. That theory is false. I let him know. This morning I went around inspecting throats with a flashlight and evaluating the sick folks for the umpteenth time. "Mom missed her calling; she should have been a doctor," said one of the children. Paul felt awful but didn't have a fever. He thought he should go to school. I talked him into also going to the doctor for a strep swab. It was positive. Amy insisted she's well enough to teach school but by the time she came home her fever was up. Unfortunately the clinic was closed by then. Ben slept in a bit this morning but decided he's well enough to venture out. Steven, who got where he is today only because he has an immune system like a brick wall, is still fine. (I mean, how else would a motherless kid survive bouts of malaria and who knows what else while on the streets?) Yes, actually Steven is very fine. This afternoon I got a few things at the Mennonite store, including a plastic bag of whole wheat flour. Steven was helping me put this stuff away, so naturally he tossed this bag in the air on his way to the cupboard. The timid little twistie came off of course and, Folks, it is unreal how far and wide a few cups of flour can go. All over Steven, my papers, the floor, the phone, the Life game Paul and the kids were playing, and even more. He cleaned for a long time, and thought he was all done, and then a couple of hours later glanced up and realized there was even flour on the clock. This brings to mind his uncle Philip, who I am told once tossed a jar of applesauce in the air in this very kitchen, and it hit the ceiling and broke. Don't ever tell me adopted kids aren't hand-picked to fit in with their families. We also had an exciting episode this morning when He Who Has Oft Been Reminded Otherwise was carrying 5 glasses at one time to the dishwasher. He broke two of them in a great clattering disaster that sent a shard of glass clear over to the fridge. One of these years, (please God??) he will get tired of spending his money replacing things he's broken. Jenny keeps galloping along at full speed. Meanwhile Emily is slowly recovering. No more fever, but she's very tired. I find it interesting that she and Ben and Paul managed to get strep at pretty much the same time, even though Emz is 3000 miles away. She manages to attend her classes but that's about it. 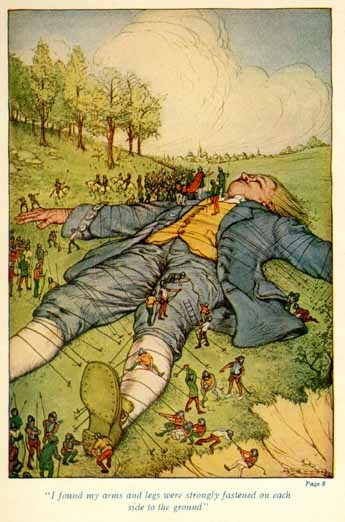 Part of my exciting life involves dealing with sick people and wishing I could tie them down like Gulliver in Lilliput. There are two kinds of sick people: A) sensible ones like me, who go straight to bed and stay there until they're well, willingly accepting sympathy and pots of tea, and B) those who see illness as a chance to be heroic, brushing off sympathy, insisting they feel better if they're at work, plowing on despite fevers and swollen throats and flushed cheeks as though the enemy will storm the gates if they abandon their posts. Yes, I am surrounded by the heroic sort. Personally I don't see anything noble in being out and about infecting everyone you see, or anything shameful about staying in bed. "I'm treating my bad very bookly." So I posted that my life wasn't very exciting. Things haven't changed a lot in that I am still preoccupied with taking care of the sick ones and trying not to get sick again myself. This narrows one's universe down to a very small radius. Amy and Ben have both been sick for a few days. Paul has been doing Amy's job at school, but now he's not feeling the best either. Technically none of us is indispensible but Paul and Amy come close. Today I followed my mom instincts and took Ben to the clinic in Harrisburg and sure enough he has strep throat. Vindication is always nice when you have to dish out $109 whether you're right or wrong. From there we dropped off newspapers at the Eugene Mission recycle box and went to the post office and mailed some more Reliv to Emily. I figured Tony at the pharmacy would have Ben's prescription ready by then so I drove over, parked in front, left Ben in the car, and went inside. When I came out I glanced in the back seat and was surprised that I had left that much junk lying on the seat. Oh well. I opened the door. An old man in the passenger seat looked at me with a very startled expression on his face. I said something very poised and coherent like, "Oh mercy me, I'm sorry!," hastily slammed the door shut, and went to MY car, which was one car to the south. Poor Ben with his sore throat was rocking back and forth laughing and laughing in a strange strangled croak. He had watched the whole drama unfold and had thought, "No, Mom! No! Not that car!!" But of course I hadn't read his mind. I plopped down in the car and we both howled. Then I looked out my window and naturally, the other car was still right there beside me, and right there in the nearest window was the old man looking out at me with a very intrigued, amused expression on his face. "Awkward" does not do this situation justice. I tried to collect my wits enough to start the car and drive home. On the way, Ben reserved the right to tell this story to the rest of the family. So, yes, I think the tide might be turning and my life might be getting exciting again. "Did you invite the old man to church? Gods plan, It werent no accident!" --Simon K., in a Facebook comment, when I posted this episode in a status update. Simon, that'll be the day if I ever have such presence of mind in such a situation. I get bored easily during sermons/speeches/talks if they don't really engage me. I tend to blame this on the speaker. Yes, I know I ought to listen even if I don't feel like it, and honestly I try, but doesn't the speaker have some responsibility to quit using so many words, and to make it a little more practical with a few real-life experiences thrown in and to vary his tone of voice? But. Recently Paul was preaching and a few rows in front of me were two brothers who were very involved with the family's newest little granddaughter and as a result didn't listen to the sermon at all. Now I like a guy gushing over a baby, that's wonderful And I will grant the baby was a cutie and I wouldn't have minded holding her myself. But it made me flame up inside to have my husband up there preaching an interesting sermon that he worked hard at, and these folks not listening. So. Was it Paul's job to be more interesting than the distractions? Or were these guys' hearts in the wrong place? And where does that put me? Surely there's some kind of middle ground of shared responsibility, and I'm wondering where others define it, for themselves and others. "They don't talk like normal people talk. They talk like Smuckers talk in an argument." ...is yet more rehashing of our bout with H1N1, which is as creative as you get when you have to write something before you're quite recovered. This morning at 4:42 I got a text from Emily asking me to pray for her because she's really sick. I should be used to having her away from home and sick, but it never gets easy. I called her a few times today. She sounded awful. Fever, cough, etc. With that, plus the fact that a whole raft of other students were also sick, I assumed they all had swine flu. The assistant dean called me, which I appreciate more than I can say, and asked about what to watch for with Emily, with her health issues and all. I said it's basically what you'd watch with anyone--listlessness, blue lips, difficulty breathing, and so on, with just a degree of extra vigilance. Remembering my too-recent tangle with swine flu, I told Emily that basically there's nothing to do but tough it out and keep drinking fluids, and before morning she'll wish she could die, but I'd appreciate it if she wouldn't. This evening her fever was high, even on Tylenol, so the deans decided to take her to the emergency room. There she was given a bag of fluids via IV, which means she was dehydrated I suppose, and then she was diagnosed with strep throat and put on an antibiotic. I can't explain how grateful I am to the kind souls who are taking care of her, and I do not envy them at all, having to make these medical judgment calls with all these young people. Sometimes I think I could almost qualify as a nurse or at least an assistant, with all my medical experience with raising six children. But there is one major difference between me and a real medical person: I get a diagnosis stuck in my head (swine flu, in this case) and it never crosses my mind that we could be looking at something else entirely (like strep.) I've done that so often it's scary. P.S. Turns out she has both strep and swine, so I wasn't so terribly far off. I am in a phase where my life isn't very exciting. A dangerous thing to say, I know, but there you are. I have been taking it seems like forever to get over the swine flu so I've been home a lot, coughing and doing laundry and picking up the house. But everyone else's life is exciting and so I am enjoying theirs vicariously, with just a bit of envy. I talked to my sis Rebecca this morning. They just took a trip to my other sister Margaret's in Pennsylvania where my niece Annette and her husband joined them and they had an early Thanksgiving together and I am happy for them but would have loved to be there too. Meanwhile Rebecca is up to her ears in ministry, since she can speak Arabic, and there are lots of Arab immigrants in the area and all kinds of astonishing doors are opening up to reach out to them. Rebecca's life is always exciting, and she has always seemed way more holy and disciplined than I am, and she is always out there doing amazing things for God, and I have been jealous of this about her since she was about 7 years old and got saved at revival meetings (evangelist: Willy Wagler) and immediately set out to share the gospel with the world, starting with her heathen little sister who didn't appreciate it, and she hasn't stopped yet. However, today Rebecca's amazing ministry included taking a lady to the doctor even though she was sick herself--not so jealous about that I guess. Then Emily is off at SMBI and in the very little communication we have she is all happy-happy-hyper-hyper-fun-fun. "Uh, Mom, is this important??" she asks distractedly as shrieks of laughter drift in from the background. Today she finally got out to an internet connection and posted a hyper post about her life, only it's kind of like those teaser ads from Prevention magazine that go on and on without telling you anything--"Keep reading, we have the most amazing WEIGHT LOSS FORMULA from 3 basic ingredients sitting in your kitchen cupboard RIGHT NOW, yes we do, just keep reading, I'm serious, THREE BASIC INGREDIENTS that you stock up on every week." You can read Emily's version of this here. This evening we went to Nolan and Edna's reception. I love weddings and newlyweds and all the girls in their pretty dresses and watching people and wondering which couples in the room are actually happy together and which little kids belong to which parents. There's a part of me that always envies newlyweds, fresh beginnings and all that. Funny moment: Paul talking business with Daniel Schrock from Smith Seed. Both guys are deaf in one ear, so they both had to crook their heads at odd angles to hear each other. Ok, who else has an exciting life? Bonnie the SIL just went to see her grandson for about a week. Well, I'm sure she went to see his parents too, but that baby exerts a powerful magnetic force. Bonnie has numerous times called me with Official News--Randy is dating!! Byran is engaged! Jessi is pregnant!! And I have never been able to call her with such news, not once. Not that I am trying to rush my children or tell them not to wait on God's time, (really, you guys) but sometimes I would love to call all the relatives and friends with NEWS. Meanwhile Matt has been living dangerously. He decided it's time to shake things up a bit with his college-student diet, so he hasn't made ramen noodles since school started. He's made fish (setting the oven on fire the first time), pork chops, and such. And then he went to WinCo and bought one of each fruit he didn't recognize. Mango, kiwi, papaya, and so on. He found out he absolutely loves starfruit. Now that's some excitement I could actually try myself, I guess. "Matt should get a job where he just explains things. He's just so good at explaining how things work." A late happy birthday to Steven, who is now 15! Sunday night he went gallivanting off to a church-youth party, so we're entering a new era, with only one child at home on youth nights. It's hard for me to think of Steven's birthday as his birthday, since I have no particular memory associated with it. To me, Christmas Eve is his birthday, the day he truly joined our family. Nevertheless, there it is: 15 years old, the official date to take the drivers-permit test, the time to join the youth group, yet another transition from kid to adult. Steven: you're an amazing, strong young man, growing in grace and character, standing for what's right. We love you. This crazy swine flu had me dragging around here all week like a teenager who stayed up too late and had to get up too early and had a bad attitude besides. Long after the fever was gone I just felt so unspeakably TIRED. Still do, in fact. I felt queasy too, so it was almost enough to make me nostalgic for pregnancy. But I am slowly getting back in the swing of things and the best part of that is just the various little dramas of life that you miss out on when you're flat in bed not caring if you live or die. Emily finished her first week at SMBI and with the 3-hour time difference and her busy schedule and the terrible Verizon reception there, I have hardly talked to her. This tends to tie me up in knots because this last year I talked to her on the phone a LOT, in fact some days I was trying to keep her alive over the phone, so to suddenly have that umbilical cord cut is traumatic but wonderful, if you get what I mean. I figure if she were sick in bed she'd call all the time, so since she doesn't, all is well. So since I don't talk to her much, and she doesn't have any siblings there to report on her, I keep checking Facebook to see if anyone has tagged her in a picture, trying to not see this as a barometer of success and friendship and adjusting and fitting in, and also trying not to despair of all the implications since it hasn't happened yet, not once. Aagghh. Then on the local scene I gave a talk to a church women's group today and they were very gracious about my not coming for the lunch but just showing up for the talk and dessert. Questions: "How did you get started writing?" "What is the difference between the Amish and the Mennonites?" I'm serious, someone asks those two every single time. Then I went to WinCo in the cold pouring rain and bought groceries and of course they had their turkey special since it's November, and of course I picked out the biggest one I could find, hoping to get a bit of mileage out of it like I try every year. And here I was still so weak and wobbly that I almost couldn't lift the dumb thing into the cart. I who pride myself on slinging milk jugs and flour sacks around like a good farm girl. Then I picked the shortest line. Why do I never learn? Whatever line I'm in has the check that doesn't clear the machine, the debit card that doesn't take, the cashier that leaves on break, every person that has any possible way of slowing things down. This time the guy ahead of me was a homeless man with a little red wagon with all his pop cans in a bag. Long after the whole counter was empty he stood right in my way so I couldn't unload my groceries and carefully counted out coins, dropped two pennies, picked them up, counted some more, and finally finally moved to the cashier to pay for his pop, which it turned out had actually been paid for by the generous woman ahead of him in line. "Ahem," I said delicately, in my nicest treat-you-with-kindness-like-a-normal-person-even-though-you're-horribly-irritating voice, "Could I move your wagon over just a bit so I can get my cart through?" There was a growl from behind the beard. "YOU. DON'T. TOUCH. THAT." Ok. Yessir. Got it. I have issues with homeless people. The old judgment vs. mercy dilemma. Obviously this guy was mentally ill but you know, even mentally ill people can be grateful and decent I would think. And then when I was thinking rapidly boiling thoughts about this guy, I happened to notice his hands, which were all freckled. Like Paul's. Which gave me a terrible turn, I mean, what if my husband was out on a cold rainy day with only half his mind and a little red wagon full of pop cans. But even then he would move so people could get through, I know he would. See, I can wring a lot of drama out of a homeless guy in the grocery checkout line. Somewhere in there the lady behind me and I started talking, since we had plenty of time to do so, and she had also survived swine flu but is fully recovered and said the only thing she's ever had that compares was pneumonia. And then she lifted the turkey out of the cart and back in for me, plus my milk and other heavy stuff, which was deeply appreciated. "This makes me feel a lot more sorry for Emily." If a snake is encountered, it can probably be easily dispatched with a blunt object such as a broom handle or a heavy object. . . Even when mortally wounded, a snake may continue to wriggle and writhe for some time. As long at it is incapable of coordinated locomotor movements, it need not be further bashed, hacked, or mutilated in response to random and ineffective reflex movements. Remember, you may want someone to positively identify the snake, and the difficulty in making an identification may be increased if you pound it to an unrecognizable pulp or a multitude of pieces. Some of you have been asking how my mom is since she spent the night in the hospital with what seemed to be a heart attack. She's actually been doing really well, and the fact is we are all mystified as to what is actually going on here. Probably 20 years ago her old long-since-retired "Dr. Guy" diagnosed her chest pains as angina and prescribed nitro pills. And it just became part of who Mom is--the little bottle tucked into its little case, always with her, just in case. The occasional news that she had another "spell" and pulled through again. And of course, the sense that her days may be numbered and she could go at any time with a serious heart attack. So she had this "spell" the other week that made her black out. And she ended up in the hospital. Where they did lots of tests. And several days later called in a cardiologist and did a stress test. And of all the bizarre things, the tests are coming back that she has an excellent heart. Arteries are open, blood is flowing, electrical impulses are impulsing, muscles are pumping. "Like an 18-year-old," said the doctor. My nurse sister Rebecca has been trying to reach the doctor to have a personal chat but hasn't been able to, but she did get the nurse to read the chart to her, at the end of which she noted that when Mom left, she was again prescribed nitro for angina. My sister will have some specific words to say to the doctor, such as, what if it's actually been acid reflux all these years, and have you actually explored these other possibilities, and if it's something else why are you still talking angina and nitro?? Sooooo happy to have a medical person in the family, I must say. So yeah, still waiting for answers. If Mom continues to do well, I plan to fly to Minnesota in early December and take her to Minneapolis for glaucoma surgery. Meanwhile, Paul's mom has been having trouble with atrial fibrillation, which makes her heart race like crazy and is very unnerving. So she's trying out different medications, and the cure is almost worse than the disease. She been a very healthy, active person and it's been hard to have her life curtailed by this. Again, we're thankful for the family go-to medical person, Barb the doctor. It is a bit strange for both Paul and I to have all this action going on at the same time with our moms' hearts. Meanwhile it is very nice to know that in a larger sense their hearts are in good shape and in good hands. I was talking to my sister-in-law Lois this morning. She and her daughter Lisa just survived the same flu I'm getting over, which I apparently caught from Lisa last Tuesday when she was here helping me with some cleaning and felt like she might be getting a cold. Ben is home with the same flu today. Lois told me that she was talking with the nurse practitioner at the Harrisburg Clinic and described the symptoms and was told that this is yes, definitely H1N1. Fever, cough, very contagious, very nasty, etc etc. And apparently it's too early for any other kind of flu. I had been a bit worried about getting swine flu because it's supposed to be worse for people with asthma. But so far I can still breathe ok. Somehow this makes me feel better to know that I'm actually a Swine Flu Survivor!! They ought to give you a little badge or something. "It 's a good thing Emily didn't come home right now after all." I'm well into Day 5 of a vicious flu. It started with a dry cough on Thursday and by that evening I wanted to sleep all the time, and by Friday I was in that vast miserable zone where you no longer care about anything--how the house looks, are the children eating any real food, or, in my case, genuine proof of genuine illness, that article deadline that was eating me alive faded off into unimportance. And then for a day and a half I had my monthly monster migraine on top of everything else, which seems like an appropriate punishment for, say, bin Laden if they ever catch him. So what can you do for entertainment when your eyeballs feel like hot marbles and you can hardly lift your arms off the bed? 1. Dream wild thrashing exhausting dreams in which you are forced to read pages and pages of blurry handwritten script, and strange ideas take on color and shape, and you go visit Emily at SMBI and take the wrong turn out of her dorm room in your nightgown and well, never mind. 2. Keep a laptop on the bed and learn to feel around with one finger and get on Facebook. Learn who just baked cinnamon rolls and who dressed up like what for Halloween and who was happy about the Ducks' win over USC. (Even in my state I managed some enthusiasm for that one.) Get off FB when the fireworks in your head are more than you can handle. 3. Work up the courage to reach out of bed, pour some Sprite in the little glass, and drink it. Yes, be strong. You can do this. 4. Answer phone calls from the husband, who is off in Colorado. You cough on your end and he talks on his, and the decisions get made. 5. Think up wonderful put-them-in-their-place speeches for all the times when you couldn't think of the right thing to say at the moment. 6. Go to flu.gov to take the self-test for swine flu. Fever, misery, cough, dizzy and disoriented when standing. Yes. Sore throat. No. Vomiting. Some but not enough to qualify. 7. Try to pray for your children. Lack the concentration to make it through all six. 8. Praise God over and over again that you don't have babies any more and you can just stay in bed. 9. Look up flu remedies on the internet. Most involve a combination of fresh lemon juice and various other ingredients--honey, ginger, cayenne pepper, paracetamol. What is paracetamol? Look it up on wikipedia. It's actually Tylenol. And one of its uses is--of all things--killing brown tree snakes on Guam, since cats and snakes can't handle even minute doses. Click on the link. Learn that brown tree snakes are an invasive species on Guam and they grow up to 3 meters long and there are as many as 13,000 of them per square mile on that poor island. "Snakes caused the extirpation of most of the native forest vertebrate species; thousands of power outages affecting private, commercial, and military activities; widespread loss of domestic birds and pets; and considerable emotional trauma to residents and visitors alike when snakes invaded human habitats with the potential for envenomation of small children." Uh, yeah, I would think, "considerable emotional trauma." With this info on the brain you can fall asleep and have yet more wild dreams in which Randy's sweet wife Shelley is holding a snake over your head and threatening to drop it and you can't yell of course because it's a dream.